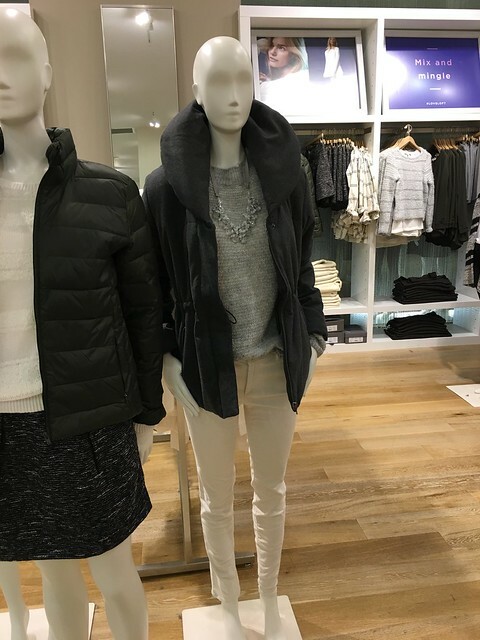 I fell in love with this stitchy mockneck sweater (see it on me here) and danging crystal ribbon necklace when I saw them paired together in store last night (refer to the picture below). The sweater was 50% off in store last night but it’s currently 40% off through Sunday. I also redeemed the coupon (JOY25) I received in the recent mailer for $25 off $50+ for the necklace since they didn’t include any cash cards with my recent orders. It’s no big deal because those cash cards make it too easy to spend more. When I contacted them in the past customer service would put the cash cards on my account but that meant that I would have to call back and place a phone order in order to redeem them. 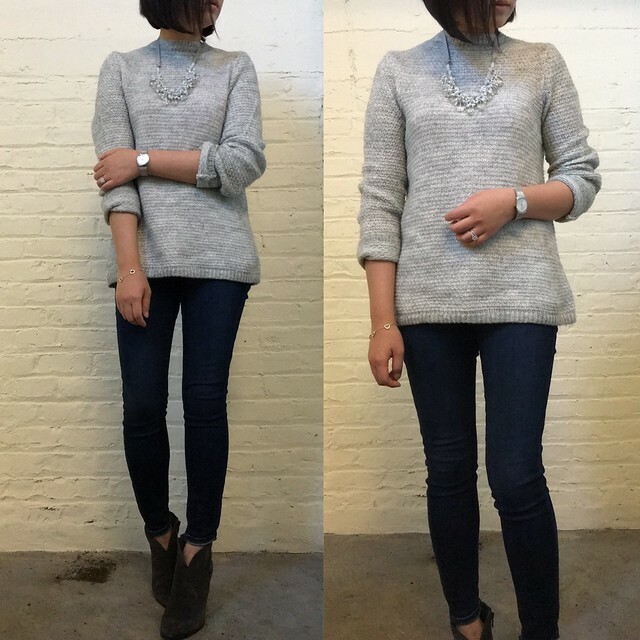 I took size S for the sweater for a more relaxed fit but it runs true to size. There is 6% mohair and 4% wool in the sweater so my neckline was a little itchy but it wasn’t unbearable. I noticed that the sleeves can stretch out throughout the day (I lean on my elbows a lot against my wrist rest) but I just washed it and they returned to their original state/shape. The necklace can snag on certain material so be careful which sweaters you pair it with especially if it has looser stitching. 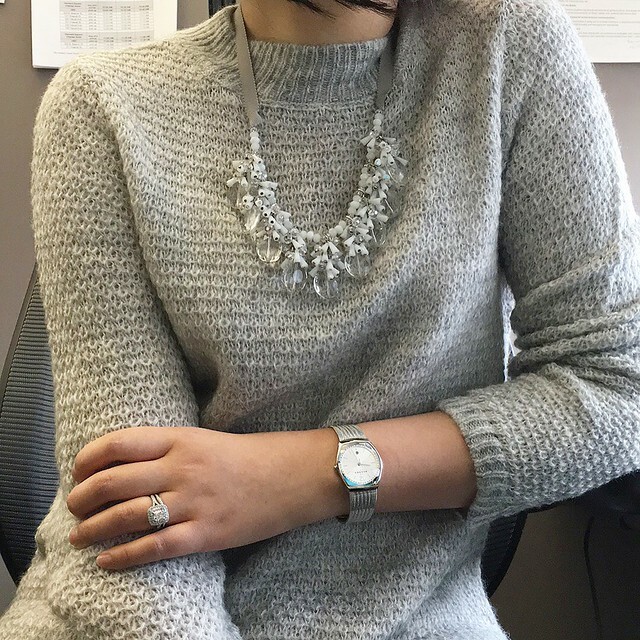 I don’t usually buy statement necklaces but I liked that this neutral piece will pair well with a lot of my sweaters which are grey. The ribbon tie allows you to adjust it to wear with many different necklines. For my last in store purchase I also got this knit anorak in size XSP. I just had to take advantage of 50% off sweaters last night. I tried on sizes XSP and SP because I wanted to see what they looked like fully zipped but I think this style looks better when worn open and unzipped. 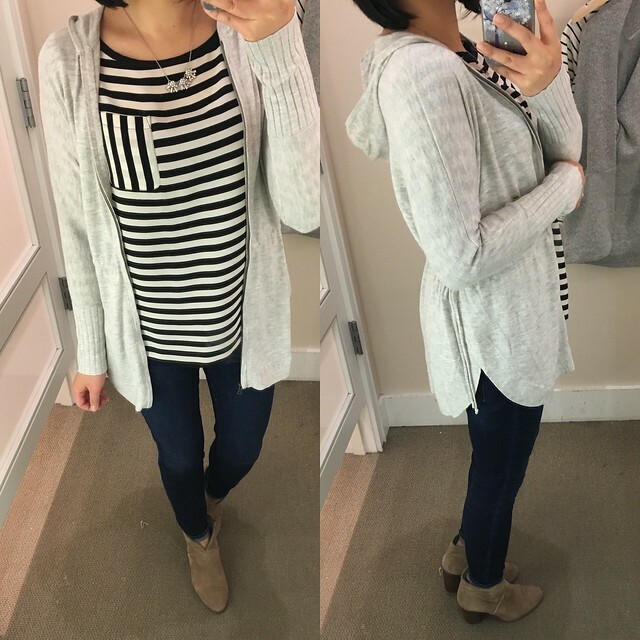 Size S was too long and sloppy looking on me but size XSP is a flattering length and drape. I love the cinched in details at the waist. Note that it’s a thinner sweater since you can see my striped top through the material. This sweater fits true to size. 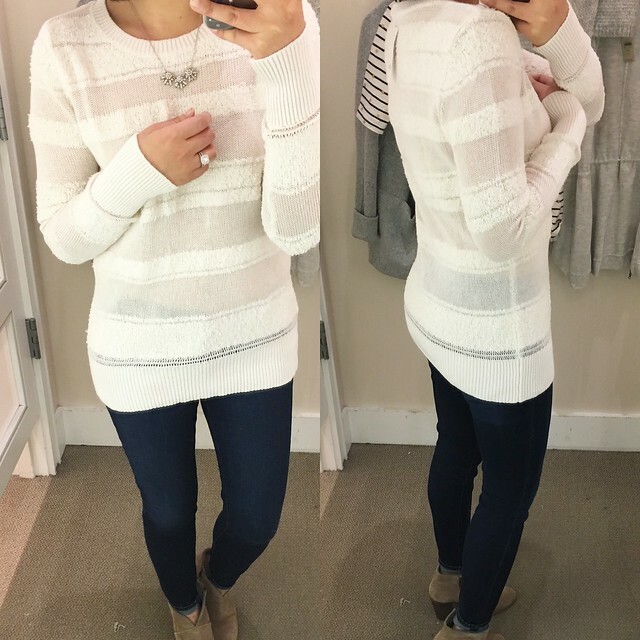 Next up is this sheer stripe sweater which I thought was really tight and narrow. True to it’s name it is sheer so it will require layering with a cami. I decided to grab size M to try on off the tables because the body looked like a slim fit. I was right because size M regular was still too form fitting for my taste, molding to my backside as you can see in the picture on right. 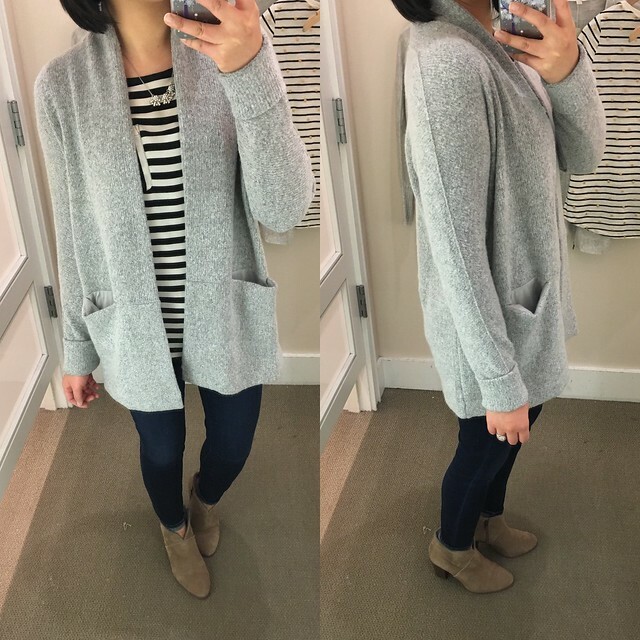 The sleeves are too long in the regular missy sizes so I would prefer this sweater in petite sizing. I’ll probably try to find petite L or XL to compare the fit in a future visit and hope that it flows away from my body. The color is more ivory in real life than pure white. I gravitate towards grey sweaters so of course I tried on this brushed open cardigan that someone abandoned on top of the sales racks. It felt really soft and warm but the slouchy pockets really bothered me. To make matters worse, the pocket lining peeks out and detracts from a more polished look. If only the pockets where more structured. Size XXSP had really long sleeves so I had to fold them once as you can see from the pictures. I’d say this sweater runs one size bigger and it still has a relaxed fit. 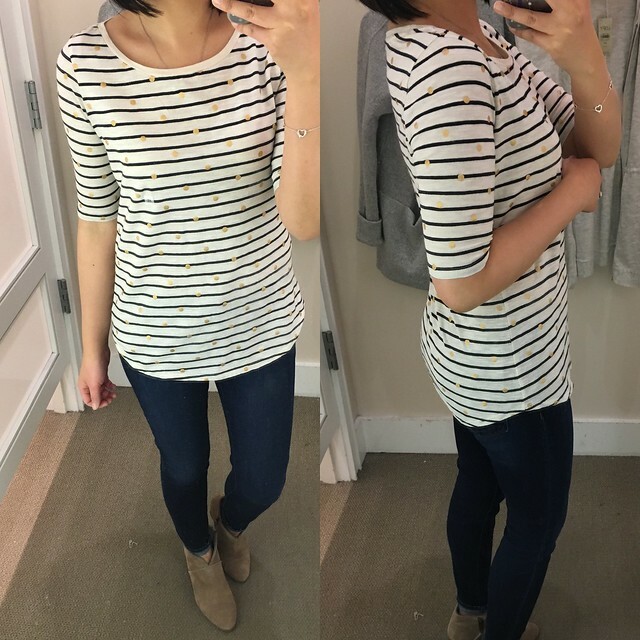 For my final try on I tried on this striped foil dot tee in size XS regular since it was on my wish list although it didn’t look like much hanging on the racks. I changed my mind before I eventually went back to grab it to try on. The half sleeves are very flattering and it’s not too tight so it skims and flatters. I’d say this tee runs true to size. I regrettably passed since it’s a thin tee and I’ve bought plenty of thin tees that go unworn or barely worn. I’ll probably try it on again in a future visit just to make sure I don’t regret my decision to leave it behind. Sometimes I look at my old try-ons and wonder why I didn’t get something but then my blog review usually jogs my memory.